What happens when the largest Customer Relationship Management tool in the world has an unplanned outage? The brand apologizes, keeps everyone informed and replies to every single message that comes its way. On May 5, Cision’s Heidi Sullivan spoke at the Conference Board of Canada’s Crisis Communications Forum in Toronto, Ontario about managing crises on social media. While watching Salesforce’s real-time responses, it is as though the brand had been a fly on the wall during her talk. 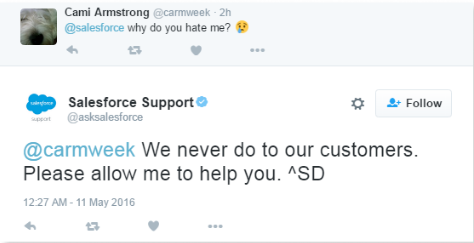 Salesforce is doing it right on social. 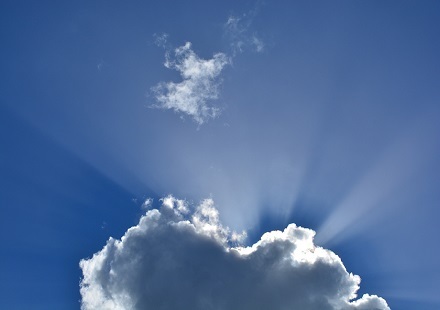 The outage started during the wee hours of Tuesday morning during a scheduled site switch for the NA14 (North America 14) instance of Salesforce. The new server infrastructure had issues shortly thereafter for about two hours, then worked fine until about 10 a.m. ET. At that point, the system had failed completely and social media erupted with complaints. Issues like this happen. 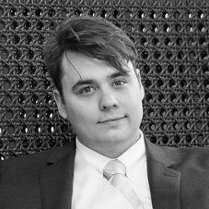 What protects a brand’s reputation over the long term is how it responds immediately after, and all indications are that the team is responding correctly. They acknowledged the issue and apologized. According to Sullivan, the first thing a brand needs to do during a crisis is acknowledge that something is happening. 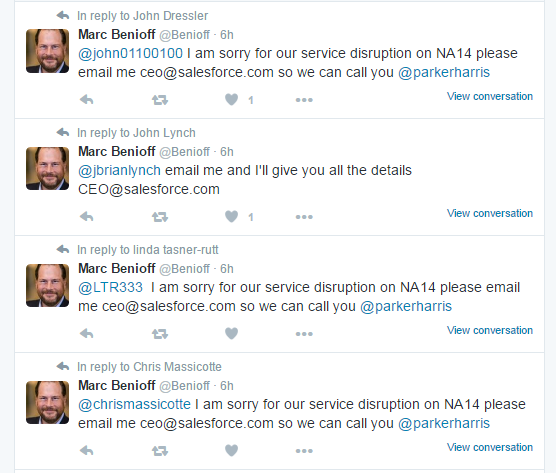 To each question raised by concerned users on Twitter to @AskSalesforce, @Salesforce and tweets directly to the company’s CEO Marc Benioff are replies apologizing for the outage and directing customers to email the company for further updates. There are literally hundreds of the messages, and Benioff is responding directly to users. This is where a social listening and engagement platform shows its true worth, allowing the brand to track and identify users with problems on the fly. 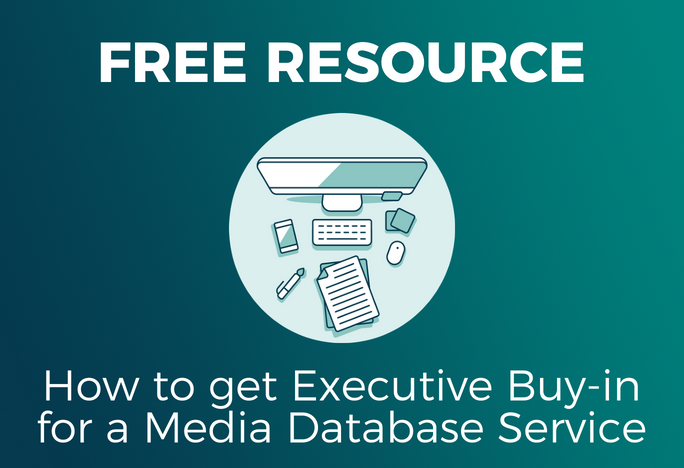 The brand also directed users to a webpage where they can check to see if their instance of Salesforce is up and running. On this site is Salesforce’s full description of the issue. 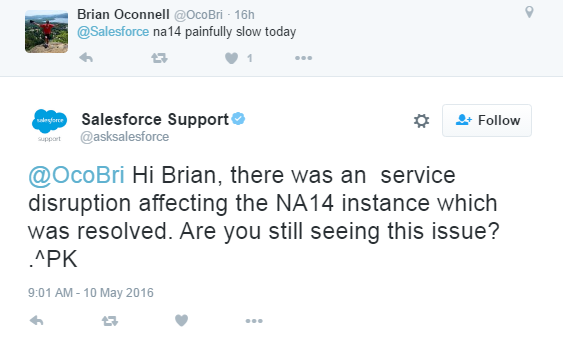 We have resolved the service disruption impacting the NA14 instance. The service disruption began at 12:41 UTC on May 10, 2016 and was resolved as of 09:30 UTC on May 11, 2016. The NA14 instance continues to operate in a degraded state. Customers can access the Salesforce service, but we have temporarily suspended some functionality such as weekly exports and sandbox copy functionality. In addition, search indexing may be delayed. The service disruption was caused by a database failure on the NA14 instance, which introduced a file integrity issue in the NA14 database. The issue was resolved by restoring NA14 from a prior backup, which was not impacted by the file integrity issues. We have determined that data written to the NA14 instance between 9:53 UTC and 14:53 UTC on May 10, 2016 could not be restored. As part of our standard process, we are performing a full root cause analysis and will provide our customers with the details once they are available. We sincerely regret any inconvenience this disruption has caused you or your organization. Ensuring your success is our top priority at Salesforce, and we’re focused on learning from this issue and preventing any recurrences. The next 24 hours will say a lot about how the brand has prepared for this sort of crisis and if it navigates these issues correctly the upside can be enriched brand trust. If it could happen to Salesforce, the industry leader in CRM tools, it could happen to anyone. Is your brand prepared? * Cision reached out to Salesforce and the company declined to comment.